IS-A Antisatellite satellite. As far as is known, follow-on models and the R-36-launched targets had a similar appearance. Russian military anti-satellite system. First operational ASAT. Tested in 1967-1971 and deployed through the late 1970's. Design as revised by Yangel and Korolev from Chelomei's original. ASAT satellite built by TsNII Kometa, Russia. Launched 1976 - 1982. AKA: 4Ya11;I2P;IS. Status: Operational 1967. First Launch: 1967-10-27. Last Launch: 1982-06-18. Number: 22 . Gross mass: 1,400 kg (3,000 lb). Launch vehicle R-36. Modernized ASAT may have been designated US-M or US-AM and was tested in 1976-1978 and operational through the late 1980's. The USA began the space weapons race with their first anti-satellite (ASAT) projects at the end of the 1950's. These limited-budget efforts were intended not to create just an anti-satellite system, but eventually to defend the entire North American continent from attack from space. Such efforts culminated in the Strategic Defense Initiative of the 1980's. On 19 June 1959 the first trial of the Bold Orion rocket, air-launched from a B-47, attempted to destroy the satellite Explorer 4, but missed it by six kilometers. Subsequent launches were not noticeably more effective. The equivalent Navy projects Caleb, Hi-Hoe were not any more effective, and further work on an air-launched ASAT was abandoned until the 1970's. The Soviet Union began work on its anti-satellite system at the beginning of the 1960's. By then it had become clear that not only rockets from space presented a threat to the nation's security. On-orbit intelligence, communications, navigation, and meteorological satellites of the enemy would have to be destroyed at the beginning of military operations. Use of an intercontinental ballistic missile with a nuclear warhead, which would be exploded in space. This was part of the Soviet military's Global Rocket projects of the early 1960's. These included the GR-1 global rocket (known in the US as the Fractional Orbital Bombing System, FOBS), and the GR-2 with a 50 megaton warhead . The advantage of this destruction of enemy satellite was that it certainly guaranteed the annihilation of all spacecraft out to a distance of 1,000 km from the site of the explosion. The drawback was that it would destroy not only the enemy's spacecraft, and that the radiation and electromagnetic pulse effects of such a huge explosion were not known. Luckily for future generations, this approach was rejected and trials of nuclear weapons in space were not conducted. The United States did however deploy two such systems (Nike Zeus DM-15S and Project 437/Thor LV-2D) from 1963 to 1972. An air-launched ASAT, as had been the subject of repeated trials in the USA from 1959. This would be launched from an aircraft at an altitude of 30,000 m and lift an explosive charge of 50 kg to orbital altitude. The rocket would have to intercept the target satellite and approach to within 30 m for the satellite's destruction to be assured. Work on this project began in 1961 and continued to 1963. However, as in the US, the flight trials did not achieve any results that would justify putting the system into production. A guidance system could not be developed that was effective enough to achieve the required intercept accuracy. Manned ASAT. 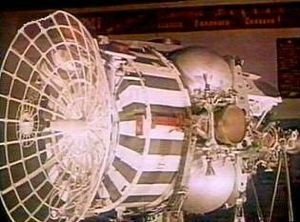 OKB-1's Filial 3, led by Kozlov, began active development of the Soyuz-P in 1964. Initially the Soyuz-P was designed for piloted inspection and destruction of enemy satellites. It was intended that the Soyuz would rendezvous with the target satellite. The cosmonaut would then exit the spacecraft and inspect the satellite. 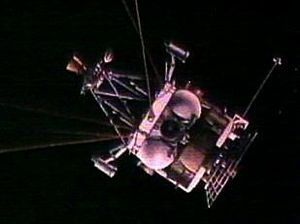 Depending on the mission and results of the inspection, the satellite would then be destroyed, neutralized, or returned to earth for further study. This approach was quickly rejected due to its multiple technical complexities and the obvious danger to the cosmonaut. All Soviet satellites were equipped with automatic destruct systems to prevent them from falling into enemy hands. These would go off if given parameters were met, even when not in radio contact with Soviet ground control. There was every reason to believe that the enemy used similar systems in their satellites. Therefore it was believed that this approach would only result in the death of the cosmonaut. Manned ASAT using stand-off inspection and weapons. The revised design was designated the Soyuz 7K-PPK (pilotiruemiy korabl-perekhvatchik, manned interceptor spacecraft). In this version, the Soyuz was equipped with eight small rockets. As in the previous case, the spacecraft would rendezvous with the enemy satellite. 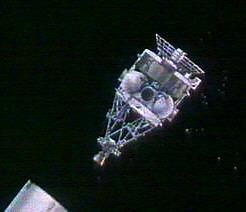 But the cosmonaut would remain in the spacecraft, using visual and other on-board systems to inspect the satellite. If the satellite was to be eliminated, the Soyuz would back off to a distance of 1 kilometer, and then destroy it using its on-board rocket-mines. A new version of the R-7 launch vehicle, the 11A514, was put into development to support launch the Soyuz 7K-PPK. In the end, delays in the development of the Soyuz and success in initial tests of the selected approach led to abandonment of this project. Unmanned satellite interceptor, similar to the manned Soyuz-PPK, which would destroy targets using on-board mine-rockets. But here again designers were unable to come up with a guidance and targeting system of sufficient accuracy to solve the difficult problem of satellite-to-satellite interception. Furthermore the interceptor would have to maneuver to a distance close enough to the target to launch its rockets, in the process itself becoming a target for enemy systems. 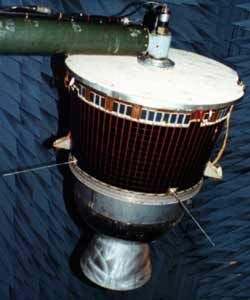 A 'kamikaze' satellite. This would not require the absolute precision of the other methods. It could have a large fragmentation charge, maneuver to the vicinity of the target, and then explode, destroying itself and the nearby enemy satellite in the process. This was the cheapest, earliest available, and easiest variant technologically. In the end it was this design that was selected for further development. Lurking unmanned space interceptor. These would be placed into earth orbit, but then stored there dormantly for a long time. At the start of military operations, they would be activated, and the spacecraft's engine would maneuver the interceptor to the vicinity of the intended target, and then explode. This system had the advantage, compared to the earth-launched kamikaze, of rapid response at the start of hostilities. But it had the disadvantage of requiring a large new engine with a substantial fuel supply so that the interceptor could quickly change its altitude and inclination to reach the required target orbits (300 to 1000 km altitude and 32 to 100 degree inclination). Such a satellite would be too large for available launch vehicles. A second disadvantage was that it was not considered possible for the on-orbit storage to be maintained for more than 6 to 12 months, which would require constant and costly replenishment of the ASAT constellation. The third and most telling disadvantage was that such on-orbit storage would turn the ASAT's themselves into targets for enemy ASAT's. Therefore this variant never got beyond the paper stage. A large space mine dispenser, which would carry 12 interceptors into orbit in a single launch. The dispenser would maneuver to the vicinity to a consecutive series of targets, and then destroy each in turn. On the plus side this approach would allow calculation and optimization of the orbit to most efficiently destroy a series of enemy satellites at the start of a conflict. However offsetting this was the extremely large and expensive nature of such a spacecraft. The chosen approach, the single-launch kamikaze, offered the earliest possible deployment date while being the cheapest to develop. As proposed by Vladimir Chelomei's OKB-52, this was designated the IS (IS, 'Istrebitel Sputnik', fighter satellite). The orbital parameters of the target satellite would already be known before launch, and the interceptor would be pre-programmed with those parameters. After being placed into an initial parking orbit by the launch vehicle, the interceptor's engine would make a number of maneuvers to intercept with the target, and at the appropriate moment, blow itself up together with the target. 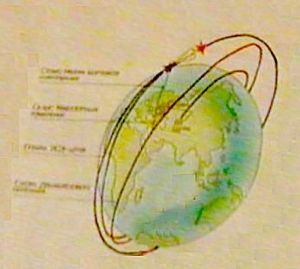 The interception was intended to take place on the first to third orbit, although it would be possible to make repeated attempts in case the target was missed. The Istrebitel Sputnik was approximately spherical in form and had a total mass of 1,400 kg. It consisted of two sections: the main section, which contained the guidance and targeting, computational and optical homing systems, and the 300 kg explosive charge; and the engine section. The body of the interceptor was designed so that after the explosion it would fragment into 12 groups of shrapnel. The specified radius of guaranteed target destruction was 1 km. However in a head-on intercept, only 400 m radius was guaranteed, while in a chase intercept, a 2 km radius of destruction could be achieved. The engine was capable of numerous quick starts and restarts, with a total operating time of 300 seconds. During the course of its operational life the spacecraft was considerably modernized, and beginning in 1976 what could be considered the 'second generation' of ASAT's was launched. Development work on the Istrebitel Sputnik began in 1961 in the construction bureau of V N Chelomei. It was intended that Chelomei would provide not only the satellite but the UR-200 launch vehicle as well. However development of the UR-200 was slower than expected, and it was decided to launch test versions of the satellite on S P Korolev's R-7 rocket. These launches received the official designation 'Polyot' ('Flight'). The first was launched on 1 November 1963. Two test trials of the Polyot were successfully completed, and it was planned that a longer series of tests would be carried out. However in October 1964 Khrushchev was ousted from power, and Chelomei lost his main patron in the hierarchy. 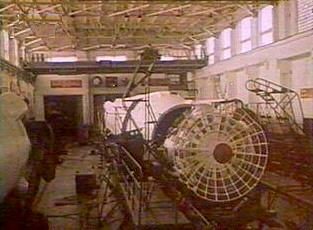 Further work on the Istrebitel Sputnik was to be transferred to Korolev's OKB, the UR-200 rocket was cancelled, and M K Yangel's R-36 ICBM was selected as the launch vehicle to replace it. These machinations resulted in a four year delay before tests of the system were resumed, and a five year delay in the operational date. The IS-A that was finally flown in the first test series in 1968-1972 (variously attributed to the Lavochkin, Chelomei and Yangel OKB's) was substantially different from the original Chelomei design. Two different targets were used in the tests. At first an R-36-launched IS-P target was used (evidently a derivative of the ASAT itself). This was replaced in 1971 by the lighter, cheaper DS-P1-M target designed by Yangel and launched by the smaller Kosmos 11K65M launch vehicle. In 1972 the USSR and USA signed the first Strategic Arms Limitation Treaty. In connection with this the trials of the Istrebitel Sputnik were discontinued, although the system was adopted as armament of the Red Army. See the chronology below for a flight-by-flight account of the test series. By 1976 modifications of the design resulted in a substantially improved IS-A (perhaps designated IS-M). This model was put through a new series of trial flights, which continued through 1978. Some sources state that a new target was used for these tests (others state that the Yangel DS-P1-M continued in use throughout the period; in any case it was still a smaller satellite launched by the Kosmos launch vehicle) . These qualified the new on-board systems, including new homing systems, and new target intercept trajectories. In 1981-1982 there were some additional test flights to test the functioning of the systems after long-term storage (these initially had very disappointing results). There were no further tests after 1982 and eventually the system was retired as technically obsolete. There were some reports that an improved version, the IS-MU, was put into operation without flight tests. It was also reliably reported that operationally the R-36-launched ASAT was replaced by another, still classified system, probably air-launched (in the 1990's satellite launch vehicles air-launched from MiG-31 fighters and Tu-160 bombers have been offered commercially; these were probably based on secret ASAT air-launched missiles). One problem in testing the system was that it inevitably created a large amount of space debris after exploding, which presented a hazard to space operations. Tests of variations in the explosive charge and the frangibility of the spaceframe resulted in from 27 to 139 fragments being left in orbit. Once the optimum fragmentation pattern was determined, later tests did not ignite the charge in order to prevent the creation of additional space debris. It was interesting to compare the test results as now known with the results as guessed by Western observers. It was clear that some deliberate deception was going on - after successful tests the ASAT would sometimes be destroyed by its self-destruct system or deorbited, and such tests were counted as failures by Western observers. 11-1-63 - Polyot 1 - ASAT interceptor control and propulsion test. Launched by Korolev R-7 because Chelomei's own UR-200 was not yet available. Flight was considered a great success. Micro-engine fired 350 times and main stabilizing engine fired 300 times. Western intelligence assessment: ASAT interceptor control and propulsion test. 4-12-64 - Polyot 2 - ASAT interceptor control and propulsion test. Western intelligence assessment: ASAT interceptor control and propulsion test. 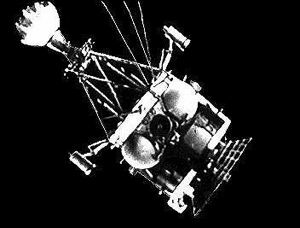 10-27-67 - Cosmos 185 - First test of Istrebitel Sputnik. Only tested engine; no target launched. First launch of Tsyklon 2 launch vehicle. Western intelligence assessment: Possible technical test of ASAT interceptor, without accompanying target. 4-24-68 - Cosmos 217 - Unsuccessful launch of ASAT target. Satellite did not separate from last rocket stage. Planned launch of interceptor cancelled. Western intelligence assessment: Not noted as ASAT-associated launch. 10-19-68 - Cosmos 248 - ASAT target. Intercepted repeatedly by Cosmos 249 on 20 October; destroyed by Cosmos 252 on 1 November. Western intelligence assessment: ASAT target. 10-20-68 - Cosmos 249- Successful - ASAT interceptor. Intercepted Cosmos 248 target on second orbit. Repeatedly approached Cosmos 248, verifying primary and reserve homing and guidance systems. Destroyed itself in test of on-board destruct system. Western intelligence assessment: Failure - ASAT interceptor. Radar guidance; intercept failed. 11-1-68 - Cosmos 252- Successful - ASAT interceptor. Intercepted and destroyed Cosmos 248 target satellite within one day of launch. Left 139 fragments in orbit, the largest of any ASAT test. Western intelligence assessment: Successful - ASAT interceptor. Radar guidance; intercept succeeded. 8-6-69 - Cosmos 291 - ASAT target. Did not enter intended target orbit due to failure of on-board engine. Launch of ASAT interceptor planned for the next day was cancelled. Western intelligence assessment: Not noted as ASAT-associated launch. 10-20-70 - Cosmos 373 - ASAT target. Maneuvered twice to provide target for Cosmos 374 and 375 interceptors. Western intelligence assessment: ASAT target. 10-22-70 - Cosmos 374- Successful - ASAT interceptor. Intercepted Cosmos 374 on second orbit. Blown up on instructions from ground. Western intelligence assessment: Failure - ASAT interceptor. Radar guidance; intercept failed. 10-30-70 - Cosmos 375- Successful - ASAT interceptor. Intercept on second orbit. Blown up on instructions from ground. Dual launch of interceptors was intended to help ground staff perfect computational methods for quick-response launches. Western intelligence assessment: Successful - ASAT interceptor. Radar guidance; intercept succeeded. 2-9-71 - Cosmos 394 - ASAT target. First test using Yangel-designed lighter, cheaper target launched by Kosmos 11K65M booster from Plesetsk. Western intelligence assessment: ASAT target. 2-25-71 - Cosmos 397- Successful - ASAT interceptor. Intercept and destruction of target successful on second orbit. Western intelligence assessment: Successful - ASAT interceptor. Radar guidance; intercept succeeded. 3-19-71 - Cosmos 400 - ASAT target for Cosmos 404 interceptor. Western intelligence assessment: Successful - ASAT interceptor. Radar guidance; intercept succeeded. 4-4-71 - Cosmos 404- Successful - ASAT interceptor. Conducted an extended test flight to shake out homing system and engine function. Tested new redundant ranging systems. Tested effectiveness of new approach trajectory to target, (target was approached from above rather than below). Western intelligence assessment: Successful - ASAT interceptor. Radar guidance; intercept succeeded. 11-30-71 - Cosmos 459 - ASAT target for Cosmos 462 interceptor. Western intelligence assessment: ASAT target. 12-3-71 - Cosmos 462- Successful - ASAT interceptor. Successfully intercepted and destroyed Cosmos 459 target. This completed state trials test series and in 1972 the Istrebitel Sputnik was adopted as armament for the Soviet Army. Produced the lowest number of fragments (27) of any test. Western intelligence assessment: Successful - ASAT interceptor. Radar guidance; intercept succeeded. 9-29-72 - Cosmos 521 - ASAT target launched to test modifications to ASAT interceptor. Interceptor launch cancelled due to technical failure in target telemetry system. Signature of SALT treaty in May 1972 resulted in military being ordered to discontinue further ASAT tests. Western intelligence assessment: Not noted as ASAT-associated launch. 2-12-76 - Cosmos 803 - ASAT target. Beginning of test of second generation ASAT interceptor. Objective was to complete test series by 1978 ABM treaty date. Western intelligence assessment: ASAT target. 2-16-76 - Cosmos 804- Successful - ASAT interceptor. After intercept with target deorbited using on-board engine. Western intelligence assessment: Failure - ASAT interceptor. Radar guidance; intercept failed. 4-13-76 - Cosmos 814- Successful - ASAT interceptor. After intercept with target deorbited using on-board engine. Western intelligence assessment: Successful - ASAT interceptor. Radar guidance; intercept succeeded. 7-9-76 - Cosmos 839 - ASAT target for Cosmos 843 interceptor. Western intelligence assessment: Not noted as ASAT-associated launch. 7-21-76 - Cosmos 843- Successful - ASAT interceptor. Intercepted Cosmos 839. Deorbited after test. Western intelligence assessment: Failure - ASAT interceptor. Radar guidance; intercept failed. 11-26-76 - Cosmos 868 - Not associated with ASAT project. Western intelligence assessment: ASAT interceptor. Radar guidance; intercept failed. 12-9-76 - Cosmos 880 - ASAT target for Cosmos 886 interceptor. Western intelligence assessment: ASAT target. 12-28-76 - Cosmos 886- Successful - ASAT interceptor. Intercepted and destroyed Cosmos 880 target. Western intelligence assessment: Failure - ASAT interceptor. Optical guidance; intercept failed. 5-19-77 - Cosmos 909 - ASAT target. Western intelligence assessment: ASAT target. 5-23-77 - Cosmos 910 - Failure - ASAT interceptor. Failed to intercept Cosmos 909. Deorbited using on-board engine. Western intelligence assessment: Failure - ASAT interceptor. Radar guidance; intercept failed. 6-17-77 - Cosmos 918 - Failure - ASAT interceptor. Failed to intercept Cosmos 909. Deorbited using on-board engine. Western intelligence assessment: Successful - ASAT interceptor. Radar guidance; intercept succeeded. 10-21-77 - Cosmos 959 - ASAT target for Cosmos 961. Western intelligence assessment: ASAT target. 10-26-77 - Cosmos 961- Successful - ASAT interceptor. Succeeded in intercept of Cosmos 959. Deorbited using on-board engine. Western intelligence assessment: Successful - ASAT interceptor. Radar guidance; intercept succeeded. 12-13-77 - Cosmos 967 - ASAT target for Cosmos 970. Western intelligence assessment: ASAT target. 12-21-77 - Cosmos 970- Successful - ASAT interceptor. Intercepted Cosmos 970 target. Ordered to self-destruct following interception. Western intelligence assessment: Failure - ASAT interceptor. Optical guidance; intercept failed. 5-19-78 - Cosmos 1009- Successful - ASAT interceptor. Succeeded in intercept of Cosmos 970. Deorbited using on-board engine. Western intelligence assessment: Failure - ASAT interceptor. Optical guidance; intercept failed. 4-3-80 - Cosmos 1171 - ASAT target for Cosmos 1174 interceptor. First in a series of tests to validate functioning of system after extended storage. Western intelligence assessment: ASAT target. 4-18-80 - Cosmos 1174 - Failure - ASAT interceptor. First test of ASAT after extended storage. Missed Cosmos 1171 target by a large distance; over the two following days two more attempts were made with the backup engine, but all failed. On 20 April the satellite was self-destructed. Western intelligence assessment: Failure - ASAT interceptor. Optical guidance; intercept failed. 1-21-81 - Cosmos 1241 - ASAT target for Cosmos 1243 and Cosmos 1258. Western intelligence assessment: ASAT target. 2-2-81 - Cosmos 1243 - Failure - ASAT interceptor. Approached within 50 m of target, but explosive charge did not go off as planned. Deorbited to destructive re-entry in the atmosphere. Western intelligence assessment: Failure - ASAT interceptor. Optical guidance; intercept failed. 3-14-81 - Cosmos 1258 - Failure - ASAT interceptor. Failed to intercept Cosmos 1241 target. Deorbited to destructive re-entry in the atmosphere. Western intelligence assessment: Successful - ASAT interceptor. Radar guidance; intercept succeeded. 6-6-82 - Cosmos 1375 - ASAT target. Western intelligence assessment: ASAT target. 6-18-82 - Cosmos 1379- Successful - ASAT interceptor. Succeeded in intercept of Cosmos 1375 target. Deorbited using on-board engine. Final test of series. Western intelligence assessment: Failure - ASAT interceptor. Optical guidance; intercept failed. Family: anti-satellite. Country: Russia. Engines: Stepanov IS/US 16 kgf. Launch Vehicles: Titan, Tsiklon, Tsiklon-2, Tsiklon-2A, Titan II SLV. Launch Sites: Vandenberg, Baikonur, Baikonur LC90/19, Baikonur LC90/20. Agency: PKO, Chelomei bureau, BMDO. Bibliography: 102, 2, 272, 279, 474, 6, 6600, 12686, 12687, 12688. 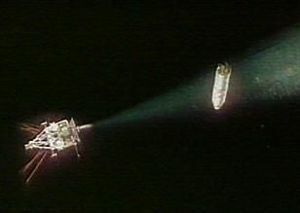 First operational ASAT, shown in a Soviet film attacking a US KH-4 Corona reconnaissance satellite. Tested in 1967-1971 and deployed through the late 1970's. Design as revised by Yangel and Korolev from Chelomei's original. Launch vehicle R-36. 1960 June 23 - . Launch Vehicle: UR-200. Chelomei Raketoplan, UR-200 ICBM, and IS antisatellite system authorised. - . Nation: Russia. Spacecraft: IS-A, Raketoplan. Decree 715-295 'On approval of preliminary work on the Raketoplan, UR-200 ICBM, and IS anti-satellite system' was issued..
1961 March 16 - . Launch Vehicle: UR-200. UR-200 (8K81) launch vehicle development authorised. - . Nation: Russia. Spacecraft: IS-A, Kosmoplan, OGCh, US-A, US-P.
An enabling decree was issued on 1 August 1961 by the Central Committee and Politburo. The UR-200 was designed not only to send a thermonuclear warhead over a range of 12,000 km, but also to orbit all of the Kosmoplan military variants: the IS ASAT; the US nuclear-powered naval intelligence satellite; and the Kosmoplan combat re-entry vehicle. 1962 July - . Launch Vehicle: UR-200. Kosmoplan and UR-200 draft projects completed. - . Nation: Russia. 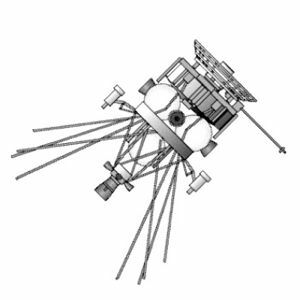 Spacecraft: IS-A, Kosmoplan, US-A. Trial flights of the ICBM version ran from 4 November 1963 to 20 October 1964. Versions of the Kosmoplan would fly as the reactor-powered US-A and solar-powered US-P ELINT satellites and the I2P ASAT..
Khrushchev ousted from power. - . Nation: Russia. Related Persons: Chelomei, Khrushchev. Spacecraft: IS-A, Kosmoplan, LK-1, OGCh, US-A, US-P. Brezhnev faction assumes control of Politubro. Brezhnev was adverse to all projects Khrushchev had supported. These included those of Chelomei and his OKB-52..
1967 March 30 - . PKO Anti-satellite Force created. - . Nation: Russia. Spacecraft Bus: Kosmoplan. Spacecraft: IS-A. Ministry of Defence Decree 'On formation of Anti-Space and Anti-Missile Forces of the Air Defence Forces (PKO) to operate General Soviet ASAT systems' was issued..
1967 July 1 - . LV Family: R-36. Launch Vehicle: Tsiklon-2. Tsiklon-2 launch vehicle authorised. - . Nation: Russia. Spacecraft: IS-A, Meteor, US-A. Council of Soviet Ministers (SM) Decree 'On use of the R-36-based launcher for the Kosmos and Meteor satellites' was issued..
1967 October 27 - . 02:21 GMT - . Launch Site: Baikonur. Launch Complex: Baikonur LC90/19. LV Family: R-36. Launch Vehicle: Tsiklon-2A. Cosmos 185 - . Mass: 1,400 kg (3,000 lb). Nation: Russia. Agency: PKO. Class: Military. Type: Anti-satellite system. Spacecraft Bus: Kosmoplan. Spacecraft: IS-A. Decay Date: 1969-01-14 . USAF Sat Cat: 3013 . COSPAR: 1967-104A. Apogee: 887 km (551 mi). Perigee: 518 km (321 mi). Inclination: 64.20 deg. Period: 98.80 min. First test of Istrebitel Sputnik. Only tested engine; no target launched. First launch of Tsykon launch vehicle..
1968 October 20 - . 04:02 GMT - . Launch Site: Baikonur. Launch Complex: Baikonur LC90/20. LV Family: R-36. Launch Vehicle: Tsiklon-2A. Cosmos 249 - . Mass: 1,400 kg (3,000 lb). Nation: Russia. Agency: PKO. Class: Military. Type: Anti-satellite system. Spacecraft Bus: Kosmoplan. Spacecraft: IS-A. Decay Date: 1968-10-20 . USAF Sat Cat: 3504 . COSPAR: 1968-091A. Apogee: 2,075 km (1,289 mi). Perigee: 498 km (309 mi). Inclination: 62.30 deg. Period: 111.30 min. ASAT interceptor. Intercepted Cosmos 248 target on second orbit. Repeatedly approached Cosmos 248, verifying primary and reserve homing and guidance systems. Destroyed itself in test of on-board destruct system. Counted as a failure by Western observers because that target was not destroyed; but this was not an objective of the test. Left 109 fragments in orbit, of which 54 were still in orbit in 1996. 1968 November 1 - . 00:27 GMT - . Launch Site: Baikonur. Launch Complex: Baikonur LC90/20. LV Family: R-36. Launch Vehicle: Tsiklon-2A. Cosmos 252 - . Mass: 1,400 kg (3,000 lb). Nation: Russia. Agency: PKO. Class: Military. Type: Anti-satellite system. Spacecraft Bus: Kosmoplan. Spacecraft: IS-A. Decay Date: 1968-11-01 . USAF Sat Cat: 3530 . COSPAR: 1968-097A. Apogee: 2,104 km (1,307 mi). Perigee: 535 km (332 mi). Inclination: 62.30 deg. Period: 112.00 min. ASAT interceptor. Intercepted and destroyed Cosmos 248 target satellite within one day of launch. Left 139 fragments in orbit, the largest of any ASAT test..
1969 December 23 - . 09:25 GMT - . Launch Site: Baikonur. Launch Complex: Baikonur LC90/19. Launch Pad: LC90/20. LV Family: R-36. Launch Vehicle: Tsiklon-2. Cosmos 316 - . Payload: IS-A Mass Model. Mass: 1,400 kg (3,000 lb). Nation: Russia. Agency: PKO. Class: Military. Type: Anti-satellite system. Spacecraft Bus: Kosmoplan. Spacecraft: IS-A. Decay Date: 1970-08-28 . USAF Sat Cat: 4282 . COSPAR: 1969-108A. Apogee: 1,638 km (1,017 mi). Perigee: 152 km (94 mi). Inclination: 49.50 deg. Period: 102.80 min. Test of Tsyklon 2 booster; mass model of ASAT. When the satellite decayed over US Midwest on 28 August 1970, teams of the USAF 1127th Special Group were able to recover six pieces from five locations in Texas, Oklahoma, and Kansas. These showed that the necessary operational systems - translation engines, sensors, weapons systems - were dummied by steel weights. However factory markings on the recovered material proved to the Air Force analysts that they were dealing with an ASAT weapon. 1970 October 23 - . 04:42 GMT - . Launch Site: Baikonur. Launch Complex: Baikonur LC90/19. Launch Pad: LC90/20. LV Family: R-36. Launch Vehicle: Tsiklon-2. Cosmos 374 - . Mass: 1,400 kg (3,000 lb). Nation: Russia. Agency: PKO. Class: Military. Type: Anti-satellite system. Spacecraft Bus: Kosmoplan. Spacecraft: IS-A. Decay Date: 1970-10-23 . USAF Sat Cat: 4594 . COSPAR: 1970-089A. Apogee: 1,464 km (909 mi). Perigee: 531 km (329 mi). Inclination: 63.00 deg. Period: 105.10 min. ASAT interceptor. Intercepted Cosmos 374 on second orbit. Blown up on instructions from ground..
1970 October 30 - . 02:36 GMT - . Launch Site: Baikonur. Launch Complex: Baikonur LC90/19. Launch Pad: LC90/20. LV Family: R-36. Launch Vehicle: Tsiklon-2. Cosmos 375 - . Mass: 1,400 kg (3,000 lb). Nation: Russia. Agency: PKO. Class: Military. Type: Anti-satellite system. Spacecraft Bus: Kosmoplan. Spacecraft: IS-A. Decay Date: 1970-10-30 . USAF Sat Cat: 4598 . COSPAR: 1970-091A. Apogee: 1,986 km (1,234 mi). Perigee: 579 km (359 mi). Inclination: 62.80 deg. Period: 111.20 min. ASAT interceptor. Intercept on second orbit. Blown up on instructions from ground. 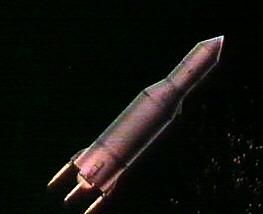 Dual launch of interceptors was intended to help ground staff perfect computational methods for quick-response launches when orbital methods of target were not precisely known. 1971 February 25 - . 11:11 GMT - . Launch Site: Baikonur. Launch Complex: Baikonur LC90/19. Launch Pad: LC90/20. LV Family: R-36. Launch Vehicle: Tsiklon-2. Cosmos 397 - . Mass: 1,400 kg (3,000 lb). Nation: Russia. Agency: PKO. Class: Military. Type: Anti-satellite system. Spacecraft Bus: Kosmoplan. Spacecraft: IS-A. USAF Sat Cat: 4964 . COSPAR: 1971-015A. Apogee: 2,164 km (1,344 mi). Perigee: 572 km (355 mi). Inclination: 65.70 deg. Period: 113.10 min. ASAT interceptor. 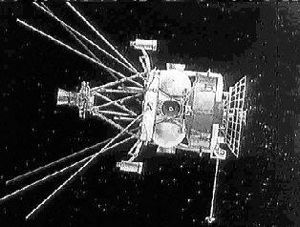 Intercept and destruction of target successful on second orbit..
1971 April 4 - . 14:27 GMT - . Launch Site: Baikonur. Launch Complex: Baikonur LC90/19. Launch Pad: LC90/20. LV Family: R-36. Launch Vehicle: Tsiklon-2. Cosmos 404 - . Mass: 1,400 kg (3,000 lb). Nation: Russia. Agency: PKO. Class: Military. Type: Anti-satellite system. Spacecraft Bus: Kosmoplan. Spacecraft: IS-A. Decay Date: 1971-04-04 . USAF Sat Cat: 5113 . COSPAR: 1971-027A. Apogee: 1,010 km (620 mi). Perigee: 802 km (498 mi). Inclination: 65.70 deg. Period: 103.10 min. ASAT interceptor. Conducted an extended test flight to shake out homing system and engine function. Tested new redundant ranging systems. Tested effectiveness of new approach trajectory to target, whereby target was approached from above rather than below. 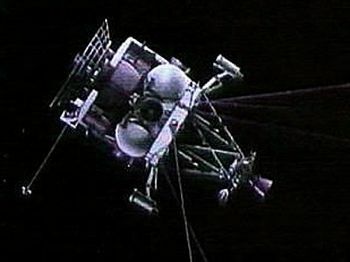 Following completion of tests and verification of system functions via telemetry, spacecraft was commanded to a destructive reentry over the Pacific Ocean. 1971 December 3 - . 13:19 GMT - . Launch Site: Baikonur. Launch Complex: Baikonur LC90/19. Launch Pad: LC90/20. LV Family: R-36. Launch Vehicle: Tsiklon-2. Cosmos 462 - . Mass: 1,400 kg (3,000 lb). Nation: Russia. Agency: PKO. Class: Military. Type: Anti-satellite system. Spacecraft Bus: Kosmoplan. Spacecraft: IS-A. Decay Date: 1975-04-04 . USAF Sat Cat: 5646 . COSPAR: 1971-106A. Apogee: 1,800 km (1,100 mi). Perigee: 229 km (142 mi). Inclination: 65.00 deg. Period: 105.40 min. ASAT interceptor. Successfully intercepted and destroyed Cosmos 459 target. This completed state trials test series and in 1972 the Istrebitel Sputnik was adopted as armament for the Soviet Army. Cosmos 462 produced the lowest number of fragments (27) of any of the ASAT's tested. 1976 February 16 - . 08:29 GMT - . Launch Site: Baikonur. Launch Complex: Baikonur LC90/19. Launch Pad: LC90/pad?. LV Family: R-36. Launch Vehicle: Tsiklon-2. Cosmos 804 - . Mass: 1,400 kg (3,000 lb). Nation: Russia. Agency: PKO. Class: Military. Type: Anti-satellite system. Spacecraft Bus: Kosmoplan. Spacecraft: IS-A. Decay Date: 1976-02-16 . USAF Sat Cat: 8694 . COSPAR: 1976-015A. Apogee: 702 km (436 mi). Perigee: 160 km (90 mi). Inclination: 65.10 deg. Period: 93.10 min. ASAT interceptor. After intercept with target deorbited using on-board engine..
1976 April 13 - . 17:16 GMT - . Launch Site: Baikonur. Launch Complex: Baikonur LC90/19. Launch Pad: LC90/pad?. LV Family: R-36. Launch Vehicle: Tsiklon-2. Cosmos 814 - . Mass: 1,400 kg (3,000 lb). Nation: Russia. Agency: PKO. Class: Military. Type: Anti-satellite system. Spacecraft Bus: Kosmoplan. Spacecraft: IS-A. Decay Date: 1976-04-13 . USAF Sat Cat: 8806 . COSPAR: 1976-034A. Apogee: 480 km (290 mi). Perigee: 118 km (73 mi). Inclination: 65.10 deg. Period: 90.50 min. ASAT interceptor. After intercept with target deorbited using on-board engine..
1976 July 21 - . 15:14 GMT - . Launch Site: Baikonur. Launch Complex: Baikonur LC90/19. Launch Pad: LC90/pad?. LV Family: R-36. Launch Vehicle: Tsiklon-2. Cosmos 843 - . Mass: 1,400 kg (3,000 lb). Nation: Russia. Agency: MO. Class: Military. Type: Anti-satellite system. Spacecraft Bus: Kosmoplan. Spacecraft: IS-A. Decay Date: 1976-07-21 . USAF Sat Cat: 9043 . COSPAR: 1976-071A. Apogee: 346 km (214 mi). Perigee: 132 km (82 mi). Inclination: 65.10 deg. Period: 89.30 min. ASAT interceptor. Intercepted Cosmos 839. Deorbited after test..
1976 December 27 - . 12:05 GMT - . 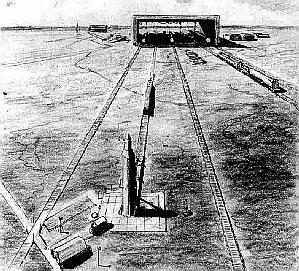 Launch Site: Baikonur. Launch Complex: Baikonur LC90/19. Launch Pad: LC90/pad?. LV Family: R-36. Launch Vehicle: Tsiklon-2. Cosmos 886 - . Mass: 1,400 kg (3,000 lb). Nation: Russia. Agency: MO. Class: Military. Type: Anti-satellite system. Spacecraft Bus: Kosmoplan. Spacecraft: IS-A. Decay Date: 1976-12-27 . USAF Sat Cat: 9634 . COSPAR: 1976-126A. Apogee: 2,291 km (1,423 mi). Perigee: 593 km (368 mi). Inclination: 65.80 deg. Period: 114.70 min. ASAT interceptor. Intercepted and destroyed Cosmos 880 target..
1977 May 23 - . 12:14 GMT - . Launch Site: Baikonur. Launch Complex: Baikonur LC90/19. Launch Pad: LC90/pad?. LV Family: R-36. Launch Vehicle: Tsiklon-2. Cosmos 910 - . Mass: 1,400 kg (3,000 lb). Nation: Russia. Agency: MO. Class: Military. Type: Anti-satellite system. Spacecraft Bus: Kosmoplan. Spacecraft: IS-A. Decay Date: 1977-05-23 . USAF Sat Cat: 10014 . COSPAR: 1977-037A. Apogee: 506 km (314 mi). Perigee: 149 km (92 mi). Inclination: 65.10 deg. Period: 91.00 min. ASAT interceptor. Failed to intercept Cosmos 909. Deorbited using on-board engine..
1977 June 17 - . 07:23 GMT - . Launch Site: Baikonur. Launch Complex: Baikonur LC90/19. Launch Pad: LC90/pad?. LV Family: R-36. Launch Vehicle: Tsiklon-2. Cosmos 918 - . Mass: 1,400 kg (3,000 lb). Nation: Russia. Agency: MO. Class: Military. Type: Anti-satellite system. Spacecraft Bus: Kosmoplan. Spacecraft: IS-A. Decay Date: 1977-06-18 . USAF Sat Cat: 10065 . COSPAR: 1977-050A. 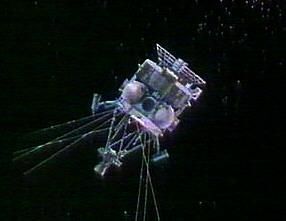 Apogee: 197 km (122 mi). Perigee: 125 km (77 mi). Inclination: 65.10 deg. Period: 87.70 min. ASAT interceptor. Failed to intercept Cosmos 909. Deorbited using on-board engine..
1977 October 26 - . 05:14 GMT - . Launch Site: Baikonur. Launch Complex: Baikonur LC90/19. Launch Pad: LC90/pad?. LV Family: R-36. Launch Vehicle: Tsiklon-2. Cosmos 961 - . Mass: 1,400 kg (3,000 lb). Nation: Russia. Agency: MO. Class: Military. Type: Anti-satellite system. Spacecraft Bus: Kosmoplan. Spacecraft: IS-A. Decay Date: 1977-10-26 . USAF Sat Cat: 10434 . COSPAR: 1977-104A. Apogee: 1,421 km (882 mi). Perigee: 269 km (167 mi). Inclination: 66.40 deg. Period: 101.80 min. ASAT interceptor. Succeeded in intercept of Cosmos 959. Deorbited using on-board engine..
1977 December 21 - . 10:35 GMT - . Launch Site: Baikonur. Launch Complex: Baikonur LC90/19. Launch Pad: LC90/pad?. LV Family: R-36. Launch Vehicle: Tsiklon-2. Cosmos 970 - . Mass: 1,400 kg (3,000 lb). Nation: Russia. Agency: MO. Class: Military. Type: Anti-satellite system. Spacecraft Bus: Kosmoplan. Spacecraft: IS-A. Decay Date: 1977-12-21 . USAF Sat Cat: 10531 . COSPAR: 1977-121A. Apogee: 1,138 km (707 mi). Perigee: 936 km (581 mi). Inclination: 65.90 deg. Period: 105.90 min. ASAT interceptor. Intercepted Cosmos 970 target. Ordered to self-destruct following interception..
1978 May 19 - . 00:21 GMT - . Launch Site: Baikonur. Launch Complex: Baikonur LC90/19. Launch Pad: LC90/pad?. LV Family: R-36. Launch Vehicle: Tsiklon-2. Cosmos 1009 - . Mass: 1,400 kg (3,000 lb). Nation: Russia. Agency: MO. Class: Military. Type: Anti-satellite system. Spacecraft Bus: Kosmoplan. Spacecraft: IS-A. Decay Date: 1978-05-19 . USAF Sat Cat: 10904 . COSPAR: 1978-050A. Apogee: 1,364 km (847 mi). Perigee: 966 km (600 mi). Inclination: 65.90 deg. Period: 108.60 min. ASAT interceptor. Succeeded in intercept of Cosmos 970. Deorbited using on-board engine..
1980 April 18 - . 00:51 GMT - . Launch Site: Baikonur. Launch Complex: Baikonur LC90/19. Launch Pad: LC90/pad?. LV Family: R-36. Launch Vehicle: Tsiklon-2. Cosmos 1174 - . Mass: 1,400 kg (3,000 lb). Nation: Russia. Agency: MO. Class: Military. Type: Anti-satellite system. Spacecraft Bus: Kosmoplan. Spacecraft: IS-A. Decay Date: 1980-04-20 . USAF Sat Cat: 11765 . COSPAR: 1980-030A. Apogee: 1,419 km (881 mi). Perigee: 372 km (231 mi). Inclination: 66.10 deg. Period: 102.90 min. ASAT interceptor. First test of ASAT after extended storage. Missed Cosmos 1171 target by a large distance; over the two following days two more attempts were made with the backup engine, but all failed. On 20 April the satellite was ordered to self-destruct in orbit, ending the longest ASAT interceptor mission. 1981 February 2 - . 02:19 GMT - . Launch Site: Baikonur. Launch Complex: Baikonur LC90/19. Launch Pad: LC90/pad?. LV Family: R-36. Launch Vehicle: Tsiklon-2. Cosmos 1243 - . Mass: 1,400 kg (3,000 lb). Nation: Russia. Agency: MO. Class: Military. Type: Anti-satellite system. Spacecraft Bus: Kosmoplan. Spacecraft: IS-A. Decay Date: 1981-02-02 . USAF Sat Cat: 12160 . COSPAR: 1981-010A. Apogee: 1,013 km (629 mi). Perigee: 294 km (182 mi). Inclination: 65.80 deg. Period: 97.80 min. ASAT interceptor. Approached within 50 m of target, but explosive charge did not go off as planned. 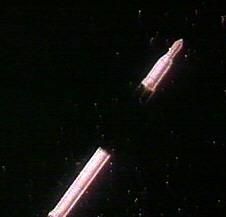 Deorbited to destructive reentry in the atmosphere..
1981 March 14 - . 16:55 GMT - . Launch Site: Baikonur. Launch Complex: Baikonur LC90/19. Launch Pad: LC90/pad?. LV Family: R-36. Launch Vehicle: Tsiklon-2. Cosmos 1258 - . Mass: 1,400 kg (3,000 lb). Nation: Russia. Agency: MO. Class: Military. Type: Anti-satellite system. Spacecraft Bus: Kosmoplan. Spacecraft: IS-A. Decay Date: 1981-03-14 . USAF Sat Cat: 12337 . COSPAR: 1981-024A. Apogee: 1,022 km (635 mi). Perigee: 299 km (185 mi). Inclination: 65.80 deg. Period: 97.90 min. ASAT interceptor. Failed to intercept Cosmos 1241 target. 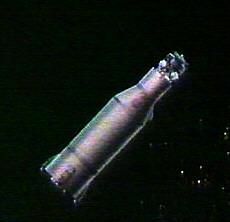 Deorbited to destructive reentry in the atmosphere..
1982 June 18 - . 11:04 GMT - . Launch Site: Baikonur. Launch Complex: Baikonur LC90/19. Launch Pad: LC90/pad?. LV Family: R-36. Launch Vehicle: Tsiklon-2. Cosmos 1379 - . Mass: 1,400 kg (3,000 lb). Nation: Russia. Agency: PKO. Class: Military. Type: Anti-satellite system. Spacecraft Bus: Kosmoplan. Spacecraft: IS-A. Decay Date: 1982-06-18 . USAF Sat Cat: 13281 . COSPAR: 1982-060A. Apogee: 546 km (339 mi). Perigee: 144 km (89 mi). Inclination: 65.10 deg. Period: 91.40 min. ASAT interceptor. Succeeded in intercept of Cosmos 1375 target. Deorbited using on-board engine. Final test of series..